How Much Does It Cost to Hire a Bike Accident Lawyer? Many attorneys are hesitant to talk about their fees. We believe in giving people as much information as possible so that they can make their OWN choices about their legal situation. The reality is, you may not need a lawyer. If we discuss your case and we don’t think you need a lawyer, we will tell you. In fact, we will go further and give you suggestions on how you might consider handling it on your own. Even if you don’t need a lawyer, we will be happy to give you our thoughts on getting your bike frame repaired or replaced all at no cost to you. However, if you have a more serious injury, particularly one that will require any type of surgery, it is always in your best interest to hire an attorney. You need to make sure things are done right. That includes reimbursing your health insurance company or Medicare on what they pay out on your behalf. Not getting that right can cause you huge problems later. Further, let’s face it, you probably have no experience putting a realistic settlement value on your injury. You’ll be dealing with an insurance company who does it every day. You need a team behind you that has the experience in dealing with insurance companies, understands the true value of your injury, and is comfortable fighting for you in front of the jury if it is required for the best interest of your case. 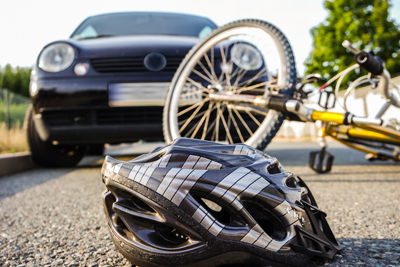 At Jim Dodson Law, our bike crash cases work on a contingent fee basis. Simply put, you don’t pay any fee unless we win. Our compensation is contingent on you getting a settlement you believe is fair. This creates an incentive for us to get the best settlement possible, and it means you don’t have to pay any money up front. I express it this way, “you only get a check, you never write a check.” Period. In the vast majority of our cases our fee is only 33%. Lawyers are permitted to increase their fee to 40% if a lawsuit is filed in the Circuit Court and the other side hires a lawyer who files their Answer. We don’t do this. I would never want you to believe there was an incentive for us to file a lawsuit simply to obtain a higher fee. Therefore, our fee will not exceed 33% even if a lawsuit is filed, if your case is settled at the mediation conference. In our experience, even in cases where a lawsuit is filed, about 70% are settled at mediation. We believe that if we can avoid the cost of preparing for trial and find a settlement your thrilled about, we want to pass that cost savings to you. What Happens if the Case Doesn't Settle at Mediation? If a case does not settle at mediation and requires scheduling a trial date, our fee will rise to the industry standard of 40% to cover the additional time, energy, and significant costs of hiring experts and preparing for trial. Again, these fees depend on winning your case. If there is no recovery, there is no fee. For more information on we encourage you to take a look at our No Promise Fee. Think about it this way: can a team that has been handling bike crash cases for decades get you 33% more money than if you try to handle all of this on your own? It’s hard to imagine a scenario where the answer is anything other than YES. Remember, we have no interest in taking a case in which we don’t believe we can help our client achieve a better settlement. If you don’t need an attorney, we will tell you straight-out you could do just as well on your own and even give you our thoughts on how you can accomplish it. In our experience, people are very appreciative that we are upfront about the cost of our services and are thankful we can give them free resources that will help them along the way. If you have any questions at all please contact us online, or, if just want to talk about your case, don’t hesitate to call our office at (888) 207-0905.